Cry it out or co-sleep? Bassinet or swing? White noise machine or Bach? How many hours anyway? For something so important, there's too much conflicting information about how best to get your baby to sleep through the night and nap successfully during the day. This book is a straightforward, no-nonsense answer to one of the biggest challenges new parents face when they welcome a brand new baby home. This book is written for exhausted parents, giving them immediate access to the information they need. Reassuring and easy to understand, Dr. Kennedy addresses head-on the fears and misinformation about the long-term effects of crying and takes a bold stand on controversial issues such as co-sleeping and attachment parenting. With polarizing figures and techniques dominating the marketplace—and spawning misinformation across the internet—Dr. Kennedy's methods and practices create an extensively researched and parent-tested approach to sleep training that takes both babies' and parents' needs into account to deliver good nights and days of sleep, and no small dose of peace of mind. 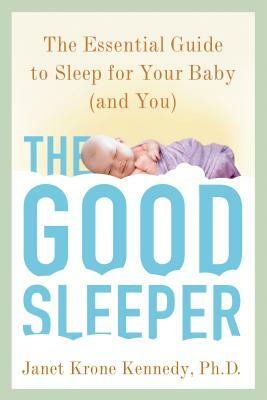 The Good Sleeper is a practical, empowering—and even entertaining—guide to help parents understand infant sleep. This research-based book will teach parents the basics of sleep science, determine how and when to intervene, and provide tools to solve even the most seemingly impossible sleep problems. Janet Kennedy, Ph.D is a clinical psychologist who spent eight years at the Manhattan Veterans Affairs Medical Center where she developed the Sleep Disorders Treatment Program. She is the founder of the successful consultation and psychotherapy practice NYC Sleep Doctor, has been featured on CBS This Morning and has been quoted in Parents Magazine, NY Press, Redbook, and the Encyclopedia Britannica website. Dr. Kennedy lives in Brooklyn, NY with her husband and two children.